One of my favorite books about gratitude is “Thanks! 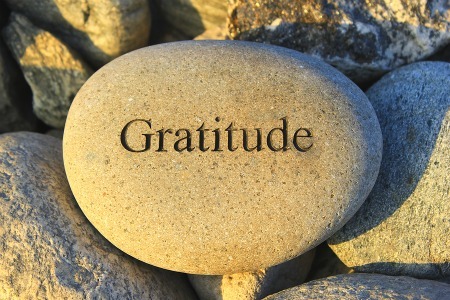 How Practicing Gratitude Can Make You Happier,” by Dr. Robert Emmons. Dr. Emmons is a gratitude guru who has dedicated his life to the study of thankfulness. Positive psychology research finds that there are health and mood benefits to practicing gratitude. Some people are naturally cheerful and thankful, but most people have to work on it. Dictionary.com says that to be grateful means “to be warmly or deeply appreciative of kindness or benefits received, to be thankful.” Gratitude is “the quality or feeling of being grateful or thankful.” Dr. Emmons’ work is grounded in the positive psychology movement, a shift in social science from studying clinical and emotional problems to studying human emotions that are healthy and pleasurable. Dr. Emmons believes that gratitude can be cultivated in a positive way and is an important component in human happiness. In one of Dr. Emmons’ most compelling research studies, he and fellow researcher, Dr. Mike McCullough, asked participants to keep a gratitude journal for 10 weeks. They were asked to write about things for which they were thankful: simple everyday pleasures, people in their lives, personal strengths or talents, moments of natural beauty, or gestures of kindness from others. By contrast, a second group was asked to focus on and write about neutral events in their lives, and a third group was asked to write about hassles. At the end of the study, the participants in the first group (abbreviated as “GG” for the remainder of this review) reported being 25% happier than those participants in the other groups. They also reported a host of other benefits, including more time spent exercising, fewer physical health complaints, and a variety of positive mood states. Even more interesting, they offered more prosocial help to other people than did the participants in the other conditions, and they reported feeling closer and more connected to others. The benefits for those people in the GG persisted for up to six months as they spontaneously decided to continue their effort. Probably because the initial results were so compelling, Dr. Emmons decided to replicate the original study, but this time with patients with neuromuscular disease. In this new study, despite their medical challenges, the participants in the GG (compared to the control group) showed significantly more positive affect and satisfaction with life, felt more optimistic about the upcoming week, and felt more connected with others. In addition, the participants in the GG reported physical benefits such as improved sleep at night and increased energy during the day. Positive psychology researchers speculate that the human brain cannot simultaneously hold two mutually exclusive emotional states. For example, relaxation is incompatible with stress, and depression is incompatible with gratitude. Dr. Emmons argues that the research is overwhelmingly positive about the benefits of thankfulness, so he concludes the book with specific suggestions for how to cultivate it. One of my favorite suggestions is to seek out opportunities to be grateful, even when circumstances make it more challenging. Dr. Emmons gives as an example the Dalai Lama, who says he is grateful for his enemies because they give him such opportunity to practice patience. My overall conclusion is that this book is extremely persuasive and if your personal goal is to be happier, this book can give you some specific strategies to achieve that.